This post contains a few paraphrased notes from Duct Tape Marketing's John Janstch speaking to BMA Atlanta about improving small business marketing. If your business needs more referrals, then you need to offer a better customer experience. Your business has to be on the web. To the new generation, if you are not on the web, you don't exist. Having a web presence offers validation. Service companies need a product, even if it's a small one. Inexpensive products (relative to the service cost) encourage a prospect to try the service. Then if they like it, they'll buy. The best way to grow your business is through your existing customer base. 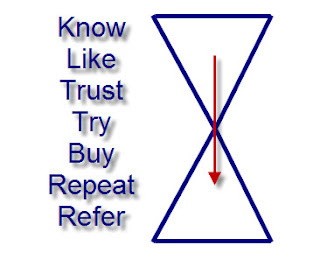 Once a prospect is a customer, keep their repeat business. Referrals and growth will follow. The Duct Tape Marketing Funnel / Hourglass (below) illustrates the flow from prospect to growth customer.